I do not know how old you are. I do not know from what country you hail. I do not know whether you are married or single, straight or gay. I do not know where you live. I do not know if you have children. I do not know whether you own a dog, or a cat, or a ferret. I do not know where you get your fruit. I do not know where you go when you need to pee. I do not know if you use mousse or spray-on gel to get that Elvis-like wave in your hair. I know you have quietly become part of my daily life. I know you make sure I smile every morning when I leave for work. I know you make sure I smile every night when I come home. I know you never run out of anything – or if you do – you apologize profusely. I know you are there for me through the hottest of days, and the coldest of nights. I know you always pet my dog, even when he rudely lifts his leg on your milk crate. I know you care that your strawberries are fresh. I know you care that your avocados are ripe. I know you never snap at my old bitty neighbors who poke at your produce and then don’t buy anything. I know your shopping bags make great garbage bags for my kitchen waste basket. I know you sometimes give me 5 bananas for $ 1 even though your sign says, “4 bananas for a $1”. I know you’ve saved me embarrassment at many a dinner party when I ran out of lettuce for the salad, or mushrooms for the soup, or cantaloupe for the dessert. I know you are a decent man because you always tell me I look pretty, even when I don’t. I do not know how you came to choose my corner. Or why you stay on my corner so faithfully. But I do know I’m real glad you’re there. Too-close-for-comfort terrorism alerts were being issued to Americans traveling to France. Torrential and relentless downpours of rain were pummeling the streets. 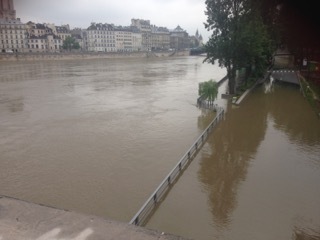 The Seine was flooding to a historic level. A strike by transit workers and airport employees was looming. Unseasonably cold temperatures were forcing us to forego wearing the Paris-style fashions we had dreamily packed in our matching luggage sets. And, in an emergency act of protecting its antiquities from drowning, the Louvre had the nerve to close its doors – literally as we were arriving at the ticket booth – rendering us unable to so much as snap a prized selfie of us surrounded by hundreds of other tourists snapping selfies of themselves snapping selfies with Ms. Mona Lisa. After an arduous day of observing the architectural wonders of Paris through the nylon of our half-broken parapluies – navigating rather crookedly and grumpily through soaked streets with our equally soaked map – we were feeling lost and dejected. None of the plans we had set forth were working out. We were feeling quite the traveling failures. And starving to boot because, somehow, in a city defined by its cuisine and dotted with myriad cafes and bistros, we had managed to forget to eat for twelve hours. So, we dipped into a hole-in-the-wall eatery next door to our understated hotel and were confronted with an alarmingly limited chalkboard menu. Once again defeatedly, we ordered the only entree we could decipher with our Rosetta Stone vocabulary: Le Hamburger. “Sounds so Frauuuuuunch, doesn’t it?” my mother and I snorted in mocking unison – laughing for the first time that day as we waited for our presumably un-French food to arrive. The dig was directed at ourselves; two women who had been so sure they’d been dining on frogs legs and snails and steak tartare. Such delicacies had so far eluded us. Mere pipe dreams now. All we wanted to do was shove something down our gullets and go to bed to sleep until our flight the following week. The jovial owner, a man with a slightly rounded belly and doughy face, brought us wine. Neither of us drinks, per se, so to be honest, those two glasses could have been filled to the brim with Tang, and Mom and I would have gulped it down with delight. But it was the gesture that we noted. 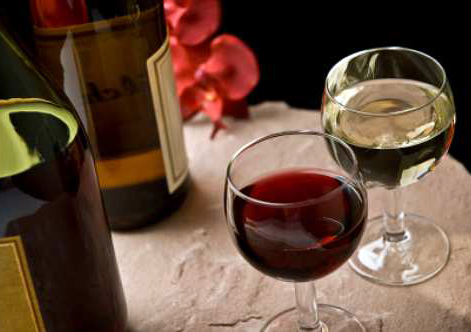 “Red or white?” he had asked us sweetly en français. And there it was. In one fell swoop, this lovely stranger had given my mother and me permission to relax. To go easy on ourselves. To enjoy. And enjoy we did. Les hamburgers arrived a few moments later. Outfitted on buns so perfectly toasted, doused in a sauce so superbly balanced in both seasoning and consistency, and garnished with a side of potatoes-something so glorious that it redefined the words pomme de terre, it was as if these magical mounds of meat had been touched by the hand of God. Mom and I groaned with delight as we took in bite after bite. Who knew hamburgers could be life-changing? We asked the owner to extend our compliments to the chef… who, as it turned out, was him. For a good two hours my mother and I sat at that hole-in-the-wall restaurant. 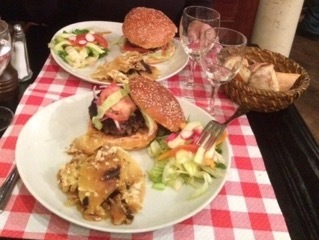 Sipping our red wine, sipping our white wine, feasting on our very French hamburgers, and enjoying. Enjoying despite the terrorism alerts. Enjoying despite the torrential downpours. The Seine flooding, the looming strikes, the unseasonably chilly air. And from that night forward, my mother and I enjoyed every inch of Paris, delightedly exploring all corners of the City of Light and Floods and Strikes. If there was a Metro line to explore, we explored it. If there was a water-logged street to stroll, we strolled it. If there was an architectural site to admire, we admired it. If there was a local to chat up, we chatted him/her up. And yes, we even got to eat frogs legs and snails and steak tartare. Despite the odds, the trip my mother had dreamed would be the mother-daughter trip of a lifetime proved to be exactly that: the mother-daughter trip of a lifetime. The only thing we didn’t get to do was visit the Louvre, which remained closed for the duration of our stay. (Apparently, that sulky Mona Lisa chick is a scaredy-cat when it comes to a little water.) But we took one heck of an awesome selfie with les hamburgers! They say the secret to a happy marriage is communication. Take your lunch or I will gut you like a fish. My only regret is not placing a comma in between the words “lunch” and “or.” Such a sloppy grammatical error will undoubtedly incline my alma mater to rescind my degree. But other than that, this note reads precisely as I intended. Why would I leave such a note for my sweet husband? Because in the hour Tommy spends preparing for his day — burdened by no responsibilities other than getting himself clean and dressed — this otherwise brilliant man demonstrates the mental capacity of a turnip. You see, in an effort to help him eat better, and reduce our expenses, I’ve kindly agreed to prepare homemade lunches for Tommy. Mind you, with no children of our own (at least none that I know of) I’m not much of a domestic. So, such a task is challenging for me. And yet, I do it. These lunches are tasty. Carefully engineered to meet Tommy’s finicky needs, containing at least one half of one third of one of the six major food groups. They are prepared with love, despite my own exhaustion from working night and day writing the next Mediocre American Novel. Through fogged contact lenses and intermittent yawns, I stumble around our kitchen each night like a crystal meth addict who’s used up her last stash, banging into countertops and fumbling over the stove — all so I can make my husband lunch. I even include real silverware with the meals, so Tommy’s tender mouth doesn’t have to chew on plastic, and hand-drawn maps so he can locate the special treats I’ve hidden at the bottom of his favorite R2-D2 lunch box. How does my husband repay me for my efforts? By forgetting to take his lunch. Every friggin’ day. “Are you cheating on my lunches with Wok ‘n Roll?” I text him after going into the fridge the next morning only to see R2-D2 staring back at me. “It’s not you, it’s me,” Tommy assures me, launching into some concocted defense about how he gets ‘confused’ in the morning, and ‘can’t find’ the kitchen. “But you had no trouble finding the computer to go on e-Bay and purchase a replica of Princess Leia in her slave bikini…” I argue back. It is usually at this point in the conversation that Tommy claims he’s suddenly caught on fire and has to shut off his phone. But tonight? The madness stops. Dear Husband: I may have sworn, under oath, to love you. But nowhere in my vows did I swear not to eviscerate you. Read the fine print, pal. It’s “until death do us part.” So, when you head out tomorrow morning, ready to take on the world, do yourself a favor and remember to take the lunch I made for you with such love. … Or I will gut you like a fish. I was waiting for the bus on East 57th Street on Wednesday evening, the day after the terrorist attack on the World Trade Center and the Pentagon. The city was eerily quiet, and I could find no reason to smile as I stood alone thinking of all that had happened to America in a few short hours. Then I heard the rumble of a motorcycle approaching the intersection at Park Avenue. The rider was cloaked in a black leather jacket and full face helmet, a phantom of sorts on the deserted street. On the rear of his motorcycle hung two tiny American flags, the kind that one buys at a Memorial Day parade. Each glowed a faint red from the taillight that shone between them. As he waited for the traffic light to change, the rider reached behind his back and carefully straightened out the Stars and Stripes on each of those tiny American flags. Then he revved the engine and sped off. It was at that moment I realized that yes, America will prevail. If you spend too much time saying yes when you want to say no, do things you don’t want to do just to please your friends, and feel like a total pushover, then you need to follow the Smart Girl’s Guide to Getting Even. Yes, it’s payback time! From difficult situations with the office jerk to the treacherous world of best-friend-stealing gal pal, it’s time to settle the score (and have a few laughs along the way) with everyone who has ever done you wrong. This creature is a walking dichotomy. He is traditionally “manly” in that he holds the door for you, but “unmanly” in that he expresses no interest in sports. He’s incredible in bed, but logs more time at the manicure salon than you do. Your mother tells you you’re lucky to have a guy with such a flair for designing window treatments, and your friends are jealous of your modern, metrosexual boyfriend, who always looks and smells fabulous. You know you should be thrilled, but sometimes you can’t help but wonder … is he gay? It’s revenge time: The key to handling Mr. Sexually Ambiguous is to suppress his feminine side as best you can. Remind him that he has testicles, not breasts. Disorderly conduct: Sneak into Mr. Sexually Ambiguous’ dresser drawer and wreak havoc on his organizational system. Crumple up his shirts, mismatch his Polo socks, and – gasp! – un-color-coordinate his tie collection. The first step toward making him a real man is forcing him to live like a slob. Somewhere over the rainbow: Tape over Mr. Sexually Ambiguous’ Judy Garland movie marathon with something really manly, like the Super Bowl or NASCAR. The walk-in closet: Lock Mr. Sexually Ambiguous in the closet and ask him when he wants to “come out.” This doesn’t really serve any purpose, but it sure is funny, right? This jerk spends his day ogling your breasts, mocking women’s sport teams and hanging posters of bikini-clad women straddling Corvettes all over the office. He laughs if you try to lift a pencil without assistance and audibly scoffs at any professional success you achieve because he believes it can only be the direct result of sexual favors, not hard work. It’s revenge time:Nothing ruins the Chauvinist Pig’s day more than a woman in power. And you, Smart Girl, have all the power. All you have to do is learn how to use it and abuse it. Won’t you join us? Sign up the Chauvinist Pig for e-mail alerts from Oprah’s Web site. There are just so many times this neanderthal can receive invitations to Oprah’s Web forum on “America’s Most Powerful Women” without giving his sexist philosophy some second thoughts. Yes sir, ma’am: Keep calling him “Miss” by accident. If you do this enough, the Chauvinist Pig will begin to wonder if it’s something he’s doing wrong. Happy birthday! Hire a male she-stripper for the Chauvinist Pig’s birthday party. Then videotape the lap dance and broadcast it on the Internet. Send a copy to his mother, too … and his poker buddies … oh, and his preacher. You throw a little party at your house and invite a select group of friends. Before you know it, not only has all the onion dip been devoured but the Social Parasite has crashed the gig and homed in on all your pals. Rather than going out and getting her own friends, she simply exchanges phone numbers and e-mail addresses with your friends. And soon she’s road-tripping to Canada with your best friend … without you. The good, the bad and the really fugly: Begin socializing only with people who have disgusting skin problems and facial ticks, problems controlling their bodily functions and bad breath. This way the Social Parasite won’t be so inclined to pick from your crop. Or borrow your lip gloss for that matter. Crazy for you: Introduce the Social Parasite to your “new best friend” and suggest they begin hanging out together. What she doesn’t know is that this new friend is a complete psycho with serious separation anxiety issues. Les-bi-friends: Whenever you see the Social Parasite moving in on one of your girlfriends, pull your girlfriend aside and explain that the Social Parasite is an aggressive lesbian who doesn’t take no for an answer. You may think you won today. You may think that you intimidated me with that glare you gave me as I sat stunned on the ground. You may think you’re tough. That hurting a woman who did nothing to you but accidentally bump into you on a crowded street somehow makes you Lord of the Streets now. This is New York City, pal. To survive the chaos, each of us has to decide which kind of New Yorker we want to be: the kind who deals with the crowds politely, or the kind who resorts to violence. You chose aggression, finding joy in making someone else feel weak. Vulnerable. Perhaps, you were having a bad day? Well, Mr. Creep, a lot of people are having even worse days. And yet, none of those people are going around hurting others. I bet you’re at home right now smirking to yourself because you scared a woman today. Shame on you. But if you think I’m at home right now loving N.Y.C. any less because of you, you would be wrong. About 20 blocks after you shoved me, I had another encounter. This time a woman accidentally bumped into me. But here’s the difference, Mr. Creep. I didn’t shove her to the ground or curse at her. Instead, I just stepped aside and gave her a wide smile. I win, Mr. Creep. I win. We took our new motorcycle out for its first official spin in Manhattan this week. Here is a souvenir sketch of our experience! My husband just reviewed my sketch. My artistic rendering makes his neck look ‘freakishly absent’ when, in fact, he has ‘a terrifically present and well-defined’ neck in real life. In this drawing of mine, his right kneecap ‘appears to be oddly disjointed‘ and thereby, is an inarguable ‘mocking‘ of the knee surgery he had years ago which makes me ‘a mean wife‘.